Hi folks. 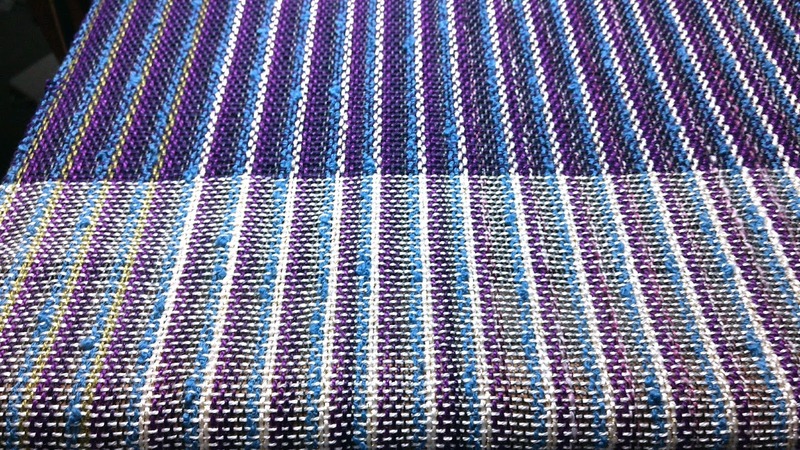 I put a new warp on the loom - or is it an old warp??? You see, I made this warp probably a year or more ago. 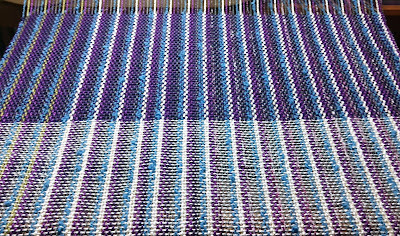 So it is an "older" warp - but it is newly on the loom. Hmmm. 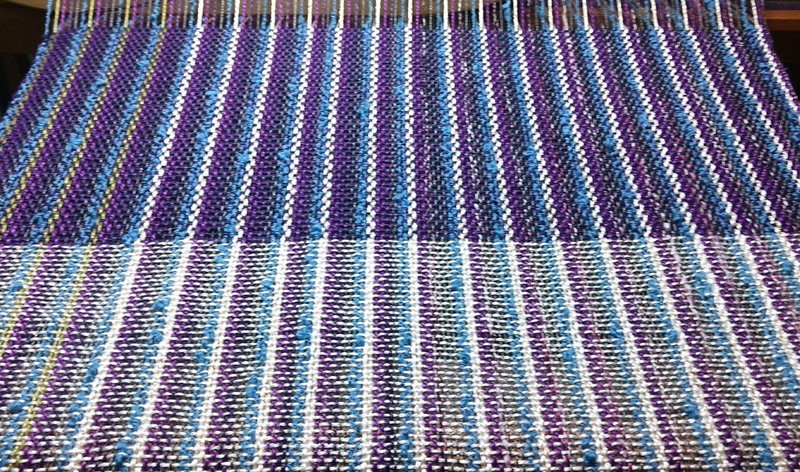 I could talk in circles about this for way too long - the point is, I have a warp on the loom. It is purple, white, dark gray and green. There are only a few threads of green on the left side of the warp. I don't remember why I didn't add some on the other side. The blue is more "medium blue" than it looks here. In the photo it looks a bit aqua, but it isn't. I started weaving it with a white thread for the weft (the crosswise thread in the fabric.) Then I switched to a combination of navy blue and purple using two threads wound onto the bobbin as one. When you see the two sections right against each other it shows clearly how much difference the crosswise thread makes in the weaving. I couldn't choose between the two photos -so I posted them both. You are NOT seeing double. 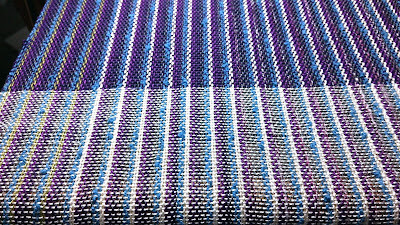 The white thread really mutes the warp threads while the purple intensifies them. Those of you who quilt (and are still reading at this point) will see the application in quilting. If you use a black background or sashing - the colors will pop forward. But using a white background or sashing will mute the impact of the colors. Also when painting, adding white to a color makes it more 'pastel' while adding a bit of black deepens the color or makes it look 'richer.' The great thing is - you only have to learn color theory for one art form and it carries over to any other art form that you try. Color your world with happiness and love. Oh yeah, add some fabric, thread and yarn in bright wonderful colors too. Excellent points made here! You have crossed the line well in explaining the effect of color and background. Love this new/old weave too! I have a beautiful warp that was given to me as a gift and I'm hesitant to start on it since I don't want to dilute the lovely colours. I've had plenty of colour theory over the years so technically I do know what I am doing, but sometimes it still takes some experimenting to come up with a colour and grist combination that I'm pleased with. Of the two weft colours in your photo, which do you personally prefer? I'm always one for bold colour myself. I guess I am going to have to go and look up warp...because in my mind I am wondering how it can be old...do you store it a certain way? You are so good with color, Gene. The weaving is so pretty. You are quit the color King!